Continuing my garden-a-plenty theme for the week… we had A LOT of cucumbers that looked perfect for pickling. They are small, green, bumpy little guys that are absolutely perfect for slicing up. Truth be told, I have never pickled or canned a thing in my life, but at 36+ weeks pregnant, I was looking for a little adventure. This seemed to do the trick! The day before I began the pickling process I tossed my cucumbers (about 8 of them) in a bowl of ice water and let it sit in the fridge overnight. I have read that this helps make them crispier! 2. I used four 8 oz. mason jars for my 8 (or so) cucumbers (about 3 to 4 inches long). Cut the ends off the cucumbers. Slice the cucumbers (whichever way you prefer) and place them in the jars while your pickling liquid is coming to a boil. 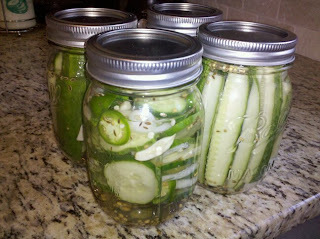 I also added sliced onion, garlic, and jalapeno peppers from my garden to some of the jars to add a little zing! I added about 1/2 teaspoon of mustard seed and dill seed to each jar. 3. 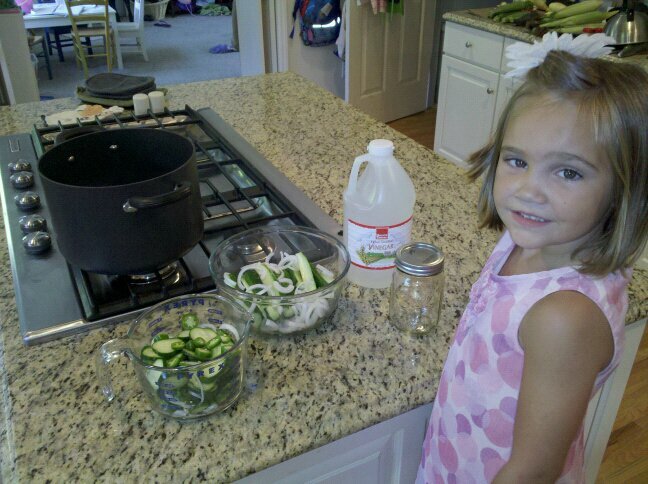 Ladle the boiling liquid over the cucumbers until they are covered. Carefully take the hot lids and rings from the water (hot water, not boiling) and seal the jars. Place the lid on tightly, hold it down with your fingers and then firmly screw the ring on. It seemed a little tricky at first, but I eventually got the hang of it. Let the jars sit until they are at room temperature – then refrigerate. I have read that you should let your pickles sit anywhere from one week to three weeks. They should be eaten within a month or so of opening them. Enjoy!